Former owner, Joan Fricker has a Card Challenge this week on her website and this is the card she made. Be sure to check out the details and enter your cards in her Challenge by visiting her at: www.joanstouch.com - I will be sending a prize to the Challenge Winner. Well, I thought Joan's card was so strikingly beautiful and since we have a wedding coming up soon also, I thought I would do a Black and White card too. I have had a Tattered Lace die that I have been wanting to try and now was the perfect opportunity. I used textured black cardstock for the body of the card and a pearlescent white cardstock to coordinate. The panels are cut from the Spellbinders die S6-005 Elegant Labels 4 (5x7) - so beautiful. 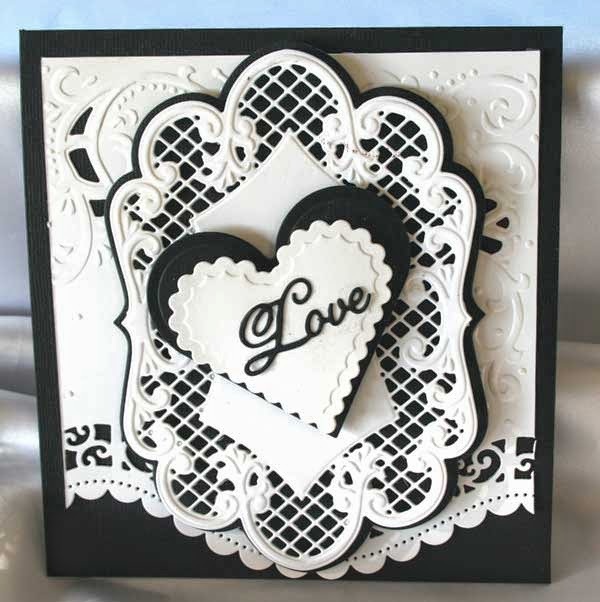 The center focus of course is the Tattered Lace die TTLD169 - Couple. I absolutely love the intricate detail of this couple. For the inside of the card I used the same Spellbinders die and stamped it with the Impression Obsession stamp D9125 and embossed it with black Super Fine Detail Embossing Powder ... I thought the sentiment went perfect with the Couple die. The black adhesive rhinestone embellishment gave it a little glitz. This kind of shows the shimmer of the pearlescent cardstock topped with a white cardstock panel. I will definitely use this again. I love the look of it...very elegant. Although you cannot see it, I brushed glue on all the little flowers and on the poppies and then brushed on Perfect Pearls in Perfect Pearl which gave them a subtle shimmer that matched the pearlescent cardstock on the other inside panel. Just GORGEOUS Terri! Thanks for sharing! Your Card is lovely Terri. I am sure the newlyweds will love it. I love all the little extras you did to it. Terri you did a wonderful job, so glad that you posted to share with us all. Keep on Crafting. Terri, your card is gorgeous. Great job!! For some reason I did not get this post. I found it today. Thanks so much for joining us at Joan's Touch for this challenge.